A scuba diver surveys bleached corals in the U.S. Virgin Islands. 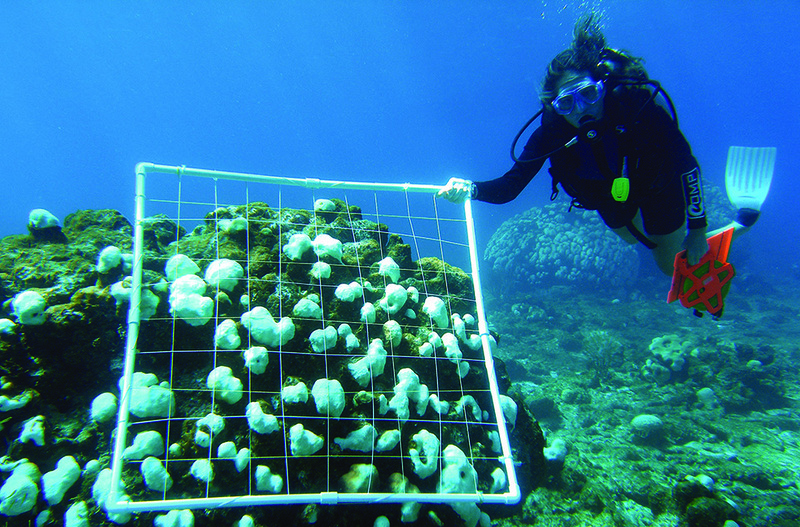 NOAA’s Coral Reef Conservation Program (CRCP) provided more than $26 million in funding in Fiscal Year 2018 for efforts that support coral reef science and management in seven U.S. states and territories. Of that, $8 million was awarded through grants and cooperative agreements to support coral reef conservation and restoration projects across the U.S., the international Caribbean, and Micronesia. Economic evaluation studies show that coral reefs contribute billions of dollars to the U.S. economy through tourism, recreation, coastal protection, and fisheries. Coral reefs are found in the following U.S. states and territories: American Samoa, the Commonwealth of the Northern Mariana Islands, Florida, Guam, Hawaii, Puerto Rico, and the U.S. Virgin Islands. The Florida Reef Tract is the third largest barrier reef ecosystem in the world and contributes billions of dollars in goods and services to Florida’s economy. The coral reefs of Puerto Rico contribute over $1 billion in goods and services to the local economy there. NOAA, together with partners, led efforts to assess the impacts and restore the damage caused by Hurricanes Irma and Maria to the reefs in Florida and Puerto Rico. The team developed a rapid assessment survey protocol that enabled scientists to immediately perform activities — such as repositioning dislodged corals and reattaching broken fragments — to address damaged areas. Findings will also inform future management of coral reef resources in the region. Funding was provided by the National Fish and Wildlife Foundation with support from NOAA’s Coral Reef Conservation Program, National Centers for Coastal Ocean Science, and National Marine Fisheries Service. 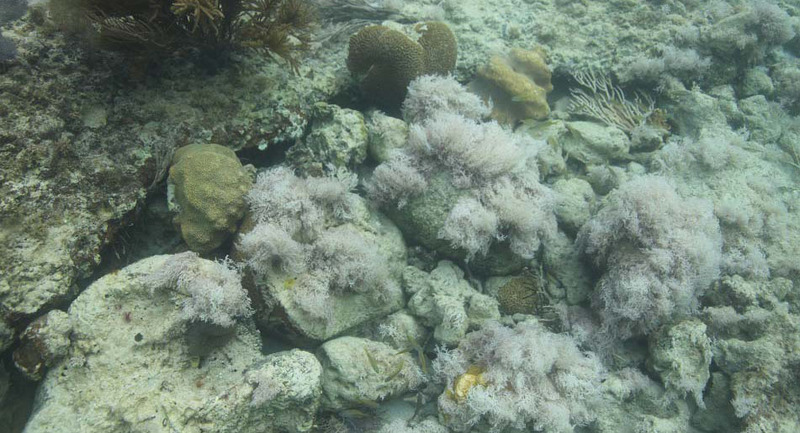 In Punta Tamarindo Chico, Puerto Rico, overturned corals with macroalgal overgrowth were a common post-hurricane sight. Scientists are concerned by the rapid growth of this pink, fleshy macroalgae. Despite powerful external forces like climate change, local actions can positively influence the future of coral reefs. 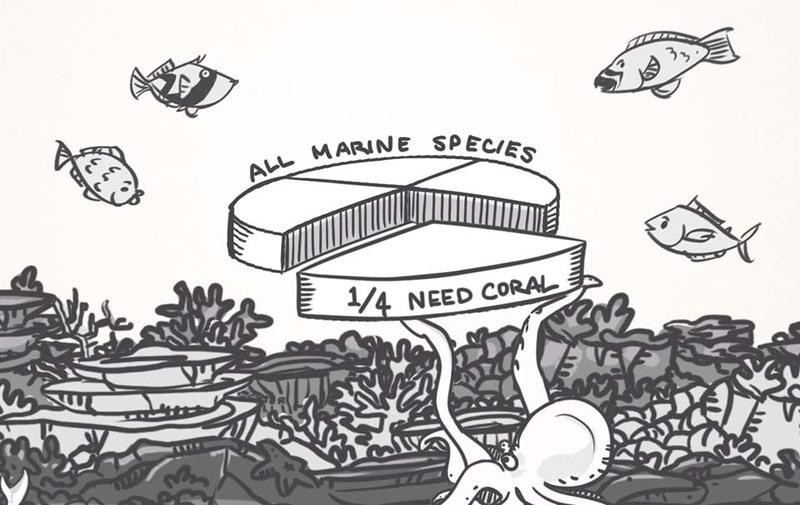 With this in mind, NOAA’s Coral Reef Conservation Program, the United Nations Environment Programme, and other partners published “A Guide to Assessing Coral Reef Resilience for Decision Support,” which presents the results of over a decade of work to establish reef resilience assessment protocols. The document outlines a 10-step process for completing a resilience assessment and provides coral reef managers with the means to map and monitor reef resilience, as well as ways to identify and prioritize actions that support resilience. 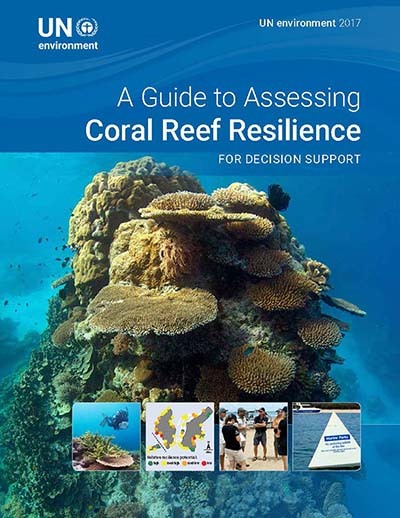 The publication “A Guide to Assessing Coral Reef Resilience” was developed by NOAA’s Coral Reef Conservation Program, the UN Environment Programme, and other partners. In 2018, the U.S. Coral Reef Task Force convened at an Environmental Law Symposium in Honolulu, Hawaii, to discuss advancing environmental law initiatives in various regions of the world. 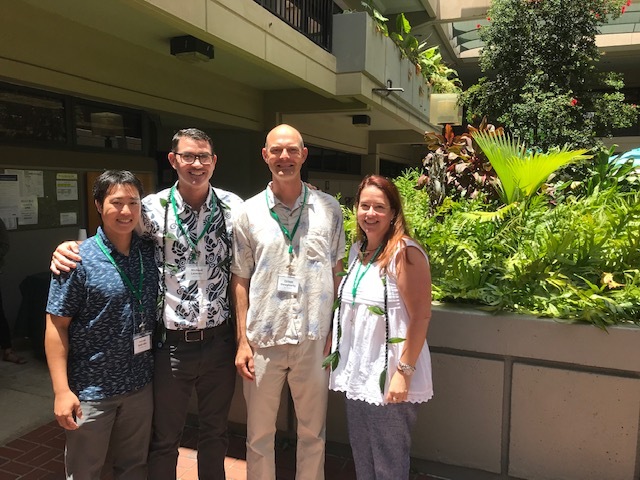 Legal Fellows, who help train environmental court judges and prosecutors and are partially funded by NOAA’s Coral Reef Conservation Program (CRCP), shared examples of strengthened legal frameworks and enforcement chains that improved reef and fisheries management. The symposium also gave other task force members, including those from Guam, Puerto Rico, the U.S. Virgin Islands, and the Commonwealth of the Northern Mariana Islands, the chance to learn from their Hawaiian colleagues’ successes and plan for their own. CRCP, NOAA Fisheries' Pacific Islands Regional Office, and the University of Hawaii’s William S. Richardson School of Law hosted the event. Healthy coral reef ecosystems pump billions of dollars into the U.S. economy — from supporting millions of jobs to protecting lives and coastal infrastructure. Communicating their value is critical to their conservation. To this end, NOAA’s Office for Coastal Management and the Coral Reef Conservation Program developed a fun and informative video, “The Coral Reef Economy,” which was awarded first place at the 2018 CINEFISH film festival. Hosted by the Gulf and Caribbean Fisheries Institute at its meeting in Merida, Mexico, the festival gave top honors in the animation category to this creative fast-draw film, which demonstrates how crucial coral reefs are to the economy. The video is available in English and Spanish.